Can Small Foe Foil Olive Fruit Fly? 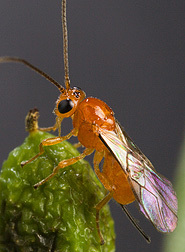 The parasitoid Psyttalia cf. concolor was discovered in Kenya, reared in a laboratory in Guatemala, and imported into California for biological control of olive fruit fly. Petite—and made almost pretty by their delicate yellow markings—olive fruit flies flourish in many of California’s olive orchards. The insect’s young, which are slender, whitish maggots, ruin both the fruit and its premium oil by feeding voraciously on the pulp of the ripening olives. An initial infestation of landscape olive trees in downtown Los Angeles in 1998 was followed by the takeover of vulnerable olive groves in The Golden State—the nation’s leading producer of this crop. Now, the newcomer fly, known to scientists as Bactrocera oleae, can be found in nearly every California county where olives are produced. But the little insect’s idyllic days in sunny California may come to an end. That’s because Agricultural Research Service entomologist Victoria Yokoyama and colleagues have studied, imported, and turned loose a promising natural enemy of the olive fly—a small wasp known as Psyttalia cf. concolor. Though harmless to people, pets, and plants, the wasp harms olive fly maggots when it lays its eggs inside them. Wasp young that hatch from the eggs slowly kill the olive fly maggots by feeding on them from the inside out. P. cf. concolor appears to be a more effective natural enemy than other olive fly parasitoids brought to California in the early 2000s, says Yokoyama, who’s based at the agency’s San Joaquin Valley Agricultural Sciences Center, near Parlier. The story of how the pugnacious parasitoid ended up as the object of Yokoyama’s intense scrutiny is a science adventure that spans half the globe—and nearly a decade. It begins in Kenya. There, during a routine expedition to find natural enemies of the Mediterranean fruit fly, an olive fly cousin, explorers added the wasp to their other finds. P. cf. concolor became one of the candidate biological-control agents the researchers shipped from Africa to entomologist Pedro Rendón in Guatemala. The insects were allowed to breed on some of the billions of medflies reared indoors there. Rendón’s team has since shipped thousands of P. cf. concolor wasps to Yokoyama for her experiments and, more recently, for putting to work in olive-fly-infested groves. Yokoyama has—with the permission of federal, state, and local agencies—unleashed willing wasps in olive groves up and down California. She and her coinvestigators have found the wasp’s success rate in parasitizing the olive fly varies markedly and “is directly related to the scarcity or abundance of the fly,” she says. She found the parasitism rate was variable in some hot, dry, inland groves, where the olive fruit fly is sparse. But in a coastal orchard heavily infested with the flies, parasitism was very high. Yokoyama’s ongoing studies, funded by the Fresno-based California Olive Committee, ARS, and other agencies, continue to reveal new details not only about the parasitoid, but also about the olive fly itself. Her research, published in Environmental Entomology and the Journal of Economic Entomology, may lead to other affordable, eco-friendly ways to protect olive trees from the destructive fly. That’s good news for California growers, who produced more than 65,000 tons of the fruit in 2008. Most of the crop is canned, but some is made into olive oil or other specialty products. What’s good for those growers is good for us, too. Olives are an excellent source of the monounsaturated fatty acids that contribute to heart health.—By Marcia Wood, Agricultural Research Service Information Staff. This research is part of Methyl Bromide Alternatives, an ARS national program (#308) described on the World Wide Web at www.nps.ars.usda.gov. Victoria Y. Yokoyama is in the USDA-ARS Commodity Protection and Quality Research Unit, San Joaquin Valley Agricultural Sciences Center, 9611 S. Riverbend Ave., Parlier, CA 93648; phone (559) 596-2751, fax (559) 596-2788. When the olive fruit fly’s lively maggots emerge from a plump, ripening olive fruit, they leave a tiny exit hole in their wake. That damage—as well as the unseen havoc that they wreak while living and feeding beneath the olive’s skin—might someday be automatically detected by a sophisticated sorting machine. The device would use leading-edge x-ray technology to quickly capture images of the freshly harvested olives as they tumble along a conveyer belt. Then, a software program would enable a computer to scan the x-ray imagery, recognize internal and external damage, and activate a sorter that would follow the computer’s commands, correctly separating undamaged olives from their ruined counterparts. Agricultural engineer Eric S. Jackson says the futuristic device would improve the speed, precision, and accuracy with which olive fly damage is today detected at processing plants. Right now that chore is mainly done by hand. Jackson and agricultural engineer Ron Haff are collaborating in the research at the ARS Western Regional Research Center in Albany, California. In preliminary experiments, the scientists have found that the software program they’re developing is able to recognize undamaged olives 90 percent of the time and severely damaged olives 86 percent of the time. Jackson says the scores demonstrate that the approach is valid—and that it needs more work. He expects to have the system ready for real-world testing in a processing plant within a year or so. ARS and the grower-sponsored California Olive Committee have funded the research. Though the team’s first tests have been with conventional film x-rays, which each take several minutes to produce, the olive-sorting device of tomorrow would rely on real-time digital x-rays, which are ready for a computer to analyze in mere hundredths of a second. The scientists are likely the first to study this promising use of real-time digital x-ray imagery. In the 1990s, other Albany scientists pioneered the use of x-ray machines to detect smuggled fruits, vegetables, and other agricultural items in luggage and freight at shipping ports and airports. The technology is still in use today.—By Marcia Wood, ARS. 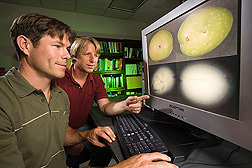 Eric S. Jackson and Ronald P. Haff are with the USDA-ARS Western Regional Research Center, Plant Mycotoxin Research Unit, 800 Buchanan St., Albany, CA 94710; phone (510) 559-5868, fax (510) 559-5684. "Can Small Foe Foil Olive Fruit Fly?" was published in the February 2009 issue of Agricultural Research magazine.